At sundown today the temperature already was only 44F. Expecting a hard freeze the next two, maybe three, nights. Here in the Sacramento Valley, I no longer have near-tropical fruit trees, but I have some tender trees that may be damaged. 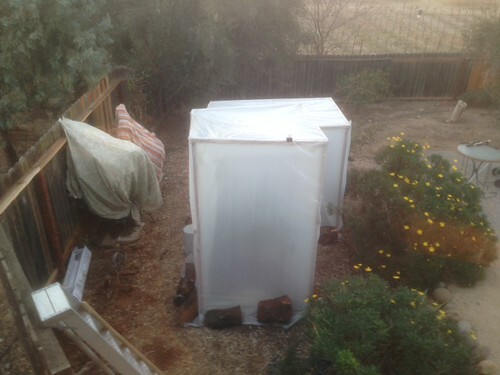 Such as the citrus trees underneath these cold frames (plastic sheeting supported by wood structure) or the (presumably less at-risk) potted plants under the cloth sheets. I hope the cold is not as bad as the Freeze of 2007, when I lost a lot of tender items, such as mangoes and sapotes and a couple of young citrus trees, in San Diego County. That’s our now-defoliated vineyard beyond the fence. Apologies for shooting the photo through the window. It’s too cold to go back outside! This entry was posted in Around the finca, FRUITS. Bookmark the permalink. In Broken Hill the temperature maxed at 41C/105.8F on Tuesday. The minimum was 27. The day after the max was 20C and the minimum was 9. Well, at almost noon, it is up to 46 here! Of course, that’s F, not C.
Oops, it just dropped back to 45. Brrrrr.